ewa-marine VC-300 rain cape, camera not included. 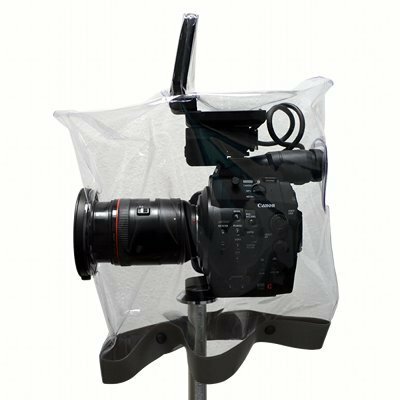 Designed specifically for the Canon EOS C300 and the C300PL camera the VC-300 raincape is manufactured from special, laminated PVC and has an integrated, optically neutral flat glass port. With this cape you will receive an 82mm filter adapter* and a RA77-82 step-up adapter. By means of this adapter the camera is then docked into the housings front port, ensuring that the lens remains parallel and centered behind the front of the lens. Just as if it were a clear, neutral optical filter. By installing an extra window on the side of the cape, you can now use the monitor in the cape. So you always have your pictures in view. As the raincape is open at the bottom, you can also use the camcorder with a tripod at any time. The raincape is closed at the bottom with two push buttons.